YOGADOO’s Bex Bridgford teaches hundreds of yogis over the weekend at the Om show for Pukka Herbs. YOGADOO has won a number of contracts with leading brands during 2019 and beyond, and is looking for the very best children's and adult’s yoga teachers all over the UK to work at events on behalf of YOGADOO. We are also working on a number of projects in specific areas of the UK where we need to expand our team. Since August, YOGADOO has worked with Pukka Herbs, firstly to provide specialist children’s yoga teachers to run a pop-up children’s yoga space at the National History museum in London over the school holidays. And this weekend YOGADOO’s Lucy Aston and Bex Bridgford ran innovative yoga sessions at the Om show at Alexandra Palace in London themed on Pukka’s brand new organic Latte blends. Anyone who is interested in finding out more is invited to fill in this form or email hello@yogadoo.co.uk or lucy@yogadoo.co.uk for a word document form to fill in. We have chosen the very best location for you to reconnect with your practice, nature and yourself. 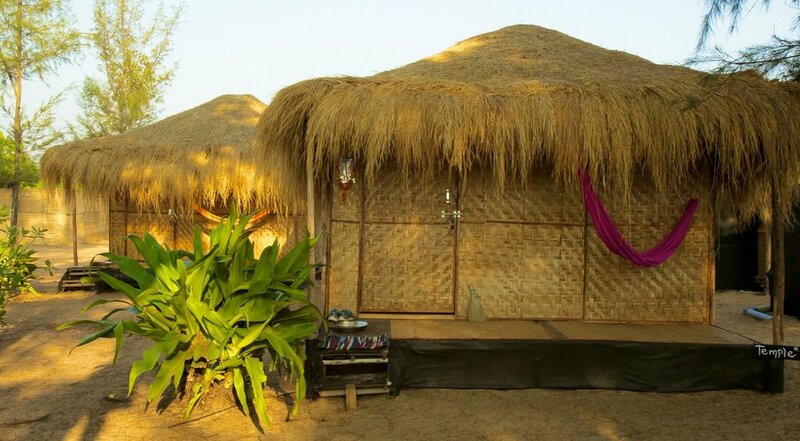 Bamboo Yoga is set right on the shoreline of the Indian ocean on Patnem beach, Goa. 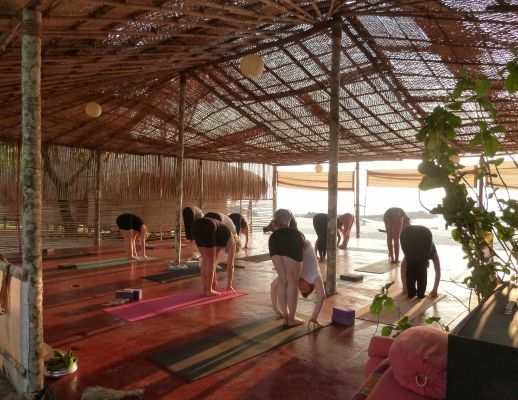 With our own private yoga shalas, which are set right on the beach. The Guardian newspaper chose Bamboo Yoga as one of the Best yoga, mindfulness and fitness breaks for 2018. 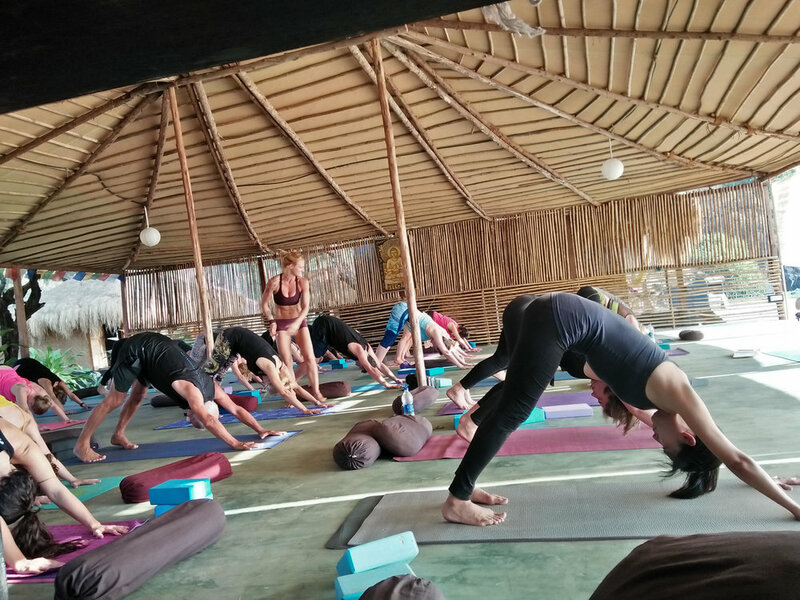 YOGADOO’s Lucy Aston and Bex Bridgford visited India earlier this year and the life-changing experience gave them both the chance to step back and realise that you can get caught up in life, and “if you don’t stop once in a while you will miss it.” Now they want to share that experience with you. Deposit of £150 secures your place on this retreat (non-returnable, limited places) or pay the full amount in one go. If you wish to pay in instalments you may make contributions at any time in £50/£100/£200 amounts. The full amount must be paid by 2nd April 2019. 50% must be paid by 2nd March. We would recommend paying £200-300 per month to make the payments of equal size between October and March. Flights are from £450 at the moment (these can fluctuate). We can book flights for you, for a small administration fee of £20. We handle all Visa applications, if your visa is not successful you will only lose £50 from your deposit. Children under 16 get in free to the exhibition and the yoga story time sessions will take place in the YOGADOO Zen Den, once a day, at 3:30pm on Saturday, and 10:30am on Sunday. Martin will be reading from “Sadsville” the book he has written to help children to deal with emotions in a digital world, whilst Lucy will lead a children’s yoga flow inspired by the book, featuring some of the characters from the story. Sadsville tells the story of a town where everyone is sad. The hero of the book, Herman and his sidekick Sandi try to solve the mystery and turn Sadsville into a happy place? The story looks at sadness and how people talk about their emotions. Martin’s charity, the Martin Roberts foundation, aims to give a copy of the book to every child in year 5 and 6 in local educational authority areas across the country. Now in its second year, the Achieve event was founded and curated by TV Presenter Martin Roberts to help improve happiness, health and wealth, and takes place this weekend at the Passenger Shed in Bristol. 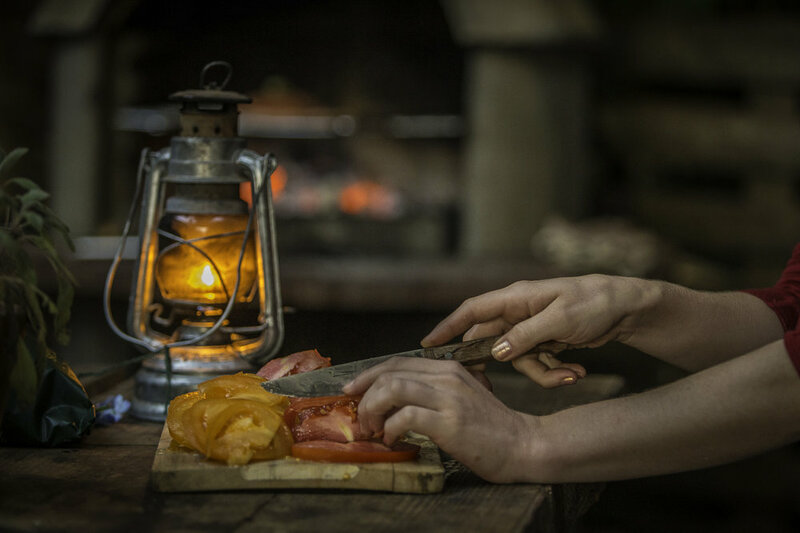 Thousands of people are expected to attend the exhibition to watch cookery, visit stands, take part in fitness demonstrations and listen to celebrity and expert speakers. YOGADOO teachers Lucy Aston and Robyn Blackmore will run hourly FREE drop in yoga and mindfulness meditation classes for children, adults and families in the YOGADOO Zen Den, The YOGADOO Zen Den timetable is listed below. These sessions are suitable for beginners and YOGADOO will provide all the mats, you just turn up in something you can move easily. Simply sign up on the day or say you are ‘Going’ to our Facebook event, spaces are limited. When there is not a class running, you are welcome to relax and enjoy your own yoga and meditation practice on the yoga mats provided. Adults and accompanied children are welcome to relax and chill out in the Zen Den, where you will be able to enjoy free samples of Pukka tea, do some mindfulness colouring and journaling, recline on beanbags and cushions and listen to some calming music whilst pausing and reflecting on what you have seen, learnt and experienced at the exhibition so far. 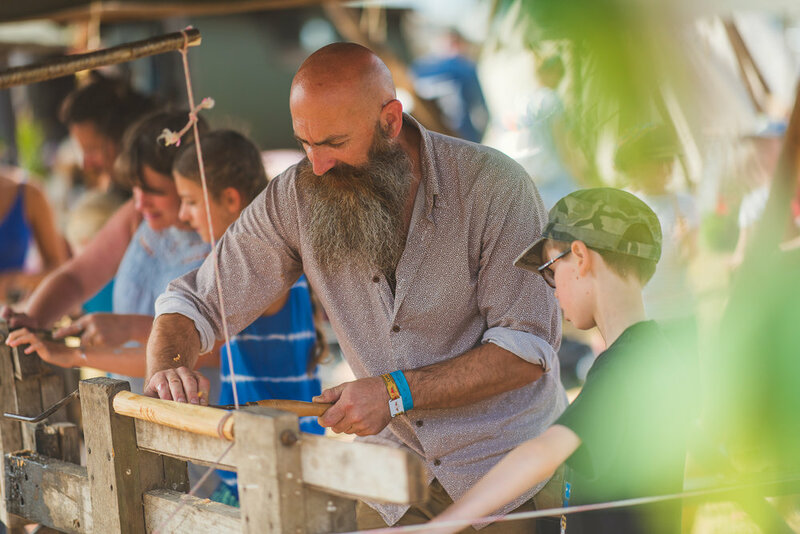 YOGADOO founder, Lucy Aston will also be giving a 30 minute talk at 1:30pm on both the Saturday and Sunday, discussing how the ancient practice of yoga and meditation can help children become more resilient in a digital world. Other speakers include MasterChef’s Gregg Wallace, comedian Helen Lederer, Winter Olympic Legend Eddie “The Eagle” Edwards and Welsh rugby referee, Nigel Owens. Ticket prices start at £25 for a one-day pass. As we all know, yoga is one of the best ways to unwind, refocus your mind, and exercise your body without straining it. Fitness Magazine lists yoga as having numerous benefits, including helping you make better meal choices, getting rid or minimising stress, and improving your immune system. It also helps with your metabolism and can even make you smarter. There are so many ways to do yoga, but for people who don't have time to head out to a yoga studio, they only have one choice—to do it at home. While this may sound ideal, there can be distractions which get in the way. That’s why when the idea to combine the Scandinavian concept of Hygge (meaning cosiness) and yoga was first voiced; it was immediately popular. 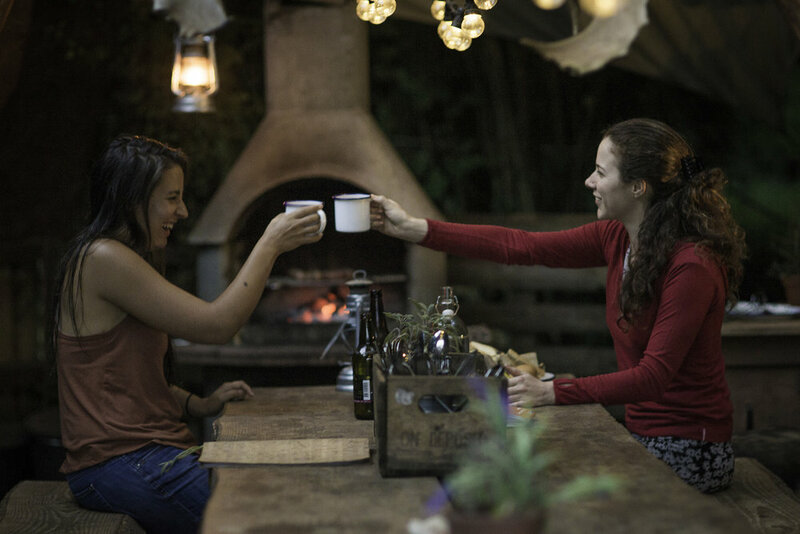 We created Hygge Yoga retreats to invite people to enjoy a simpler, calmer, and more peaceful life of finding comfort, contentment, and meaning from everyday activities. We celebrate the little things in life; having a cup of tea, wrapping yourself up in a blanket, or enjoying a piece of cake. On YOGADOO, we discussed simple ways to bring Hygge into your life, which includes taking a step back, noticing the things that matter, and restoring yourself socially and on your own. During your yoga practice at home, turn off or mute your phone so you don’t get distracted by the notifications. As much as you want to share your yoga practice, try and limit your social media time while you’re doing yoga. Focusing on one thing at a time is key. If you’re new to yoga, it can be a bit challenging to keep up with the routine especially if you’re coming home really tired from work. However, Health.com claims although following a self-care routine that does not include sitting on the sofa can be incredibly difficult, it can also be the most rewarding. Hygge also means indulging in all the good people in your life. So the next time you do yoga at home, invite a friend or two to join. Make a small tradition out of it, where at least once or twice a week, you enjoy doing yoga with some of your closest friends. You can make it a treat by making a meal for everyone to enjoy after. Studies have shown that people who regularly practice mindfulness and gratitude are not only happier, but are also more helpful, forgiving, and less materialistic. During your regular yoga sessions, with or without your friends, think of all the things you are grateful for with every intake of breath. You can ‘exhale’ any negative energy you feel brewing inside you. Nothing is cosier and more relaxing than sitting amidst nature. Doing yoga out in the open is also more relaxing, as it allows you to breathe in fresh air and listen to the calming sounds of birds and rustling leaves. Don’t worry about setting up your own little nook outside. It’s fairly easy as long as you have the right tools with you. You can choose from a pergola, a little cabin, or a small hideout that you can install in your garden. You can either build it on your own or ask some of your friends to help you with it— another chance to turn an ordinary task into a Hygge moment. The pergola page on Screwfix lists all the different types you can choose from, depending on the kind of garden that you have. Covered pergolas are also great for practicing yoga outside in all weather conditions. All you need is a little help from friends and you’re all set. The Danes didn’t become the happiest people in the world for nothing and they didn’t come up with the word Hygge for nothing, either. It just goes to show that when you pay more attention to things that really matter, you will get more out of life, which in turn can make you feel happier and more fulfilled. YOGADOO is running our ever-popular Hygge Yoga retreats from November to February at Combe Grove Hotel, just outside of Bath. A blissful day of yoga, meditation, me time and comfort food, surrounded by Hygge cosiness and nature. For more information click here. Today is World Mental Health Day, and whilst the YOGADOO team believes looking after, and having an awareness of our mental health is for life, not just for awareness days, we are launching a series of regular blog posts discussing the issues which face our, and in particular, our children and young people’s mental health in today’s modern world. YOGADOO founder and writer, Lucy Aston writes about her experiences. One lunchtime a few years ago, I was working at an advertising agency, scrolling aimlessly through the various social media channel apps on my phone “catching up” on my friend’s excitements, announcements, thoughts and news. I put my phone down, picked up my laptop and within minutes was doing the same thing again. Endlessly sliding down the timeline of someone else’s life. Why was I doing this? Was this really the most important or useful or interesting thing I could be doing right now? No. Definitely not. It was a habit, I was on auto-pilot, probably addicted to checking, and it wasn’t healthy. Rather than being filled with joy and gratitude for my life and the happiness of my friends. I was feeling anxious and at some points envious of other people’s seemingly perfect lives. These weren’t even beautiful, filtered holiday shots, these were coffee dates with pals people were enjoying, whilst I was working in an office. Job promotion announcements, dinner dates with partners, wonderful moments with children. I was getting a glimpse on a world where everyone seemed happy at a time I was stressed at work, depressed with my work life balance and feeling like I didn’t really have a handle on any part of my life. This feeling was being made worse by my resentment for others, fuelled by social media. The thoughts of these timeline-scrolling lunchbreaks still make me feel sad. I felt anxious, upset and even angry at times. But most of all I was envious. Since then, through training to be a yoga and meditation teacher and developing a daily meditation practice, my relationship to social media has changed. We live in an era of envy. Career envy, holiday envy, lifestyle envy, family life envy, life envy. Windy Dryden one of the UK’s leading practitioners of cognitive behavioural therapy, calls this “comparisonitis” and these comparisons are not realistic. We carry around the envy amplification device around with us all day, we often sleep next to it, we check it the moment we wake up and it tempts us 24 hours a day. What we choose to share online, is often filtered. Not only filtered through colours and soft edges and blurred backgrounds, but a filtered view of what our life is really like. We share the good pictures not the bad, the happy moments not the sad. What this filtered world creates is an unrealistic view of our life, which is broadcast to the world as “real”. Naturally, we compare with the “real lives” of the people we are “connected to” online, with our own “real lives” and often this creates a feeling of envy. Children are not immune from these feelings, when I work in schools, children as young as 7 or 8 talk about how they wish they could look like x y or z celebrity and those older pupils mention how social media or the need to keep messaging friends away from school makes them feel anxious or fearful of missing out. The world of beauty and make up you tube and Instagram stars encourage young people to find hair inspiration or makeup techniques, but those youngsters possibly end up envying the “stars” they follow and feeling even worse about themselves. In YOGADOO classes, we try to celebrate what makes us different and special and how are our bodies are all unique. A mindful awareness of what we can do, and what feels good is more important than comparing ourselves to others and being fearful of what we cannot do. Ironically, in a world where we have more means of connecting with others, many of us have never felt more disconnected from what is real and important. The modern, online, digital world is not going away, but how can we help ourselves or our children to become more resilient, and stay true to what is real? And please remember that we can always take a break or even delete our social media accounts. - Try and live a more mindful life – Notice the smallest details of real life around you, the colours of the falling autumn leaf, that smile on a baby’s face, the taste of your morning cuppa, the smell of the clean washing. Be in the moment without thinking too far ahead or looking back over the past. - Pausing and breathing between activities – Try and notice if you are in an auto pilot state, the first step of a mindful life is to notice repeat or habitual behaviour. So pause, take some deep breaths between activities and this will help. - Appreciation and gratitude – remember what you have in your life, who, what and where is important. Take time to appreciate these things and be grateful that your life is uniquely different to anyone else. - Celebrate differences and individuals – No two people are the same, no two lives are the same, this is a point to be celebrated and makes us humans and not robots. 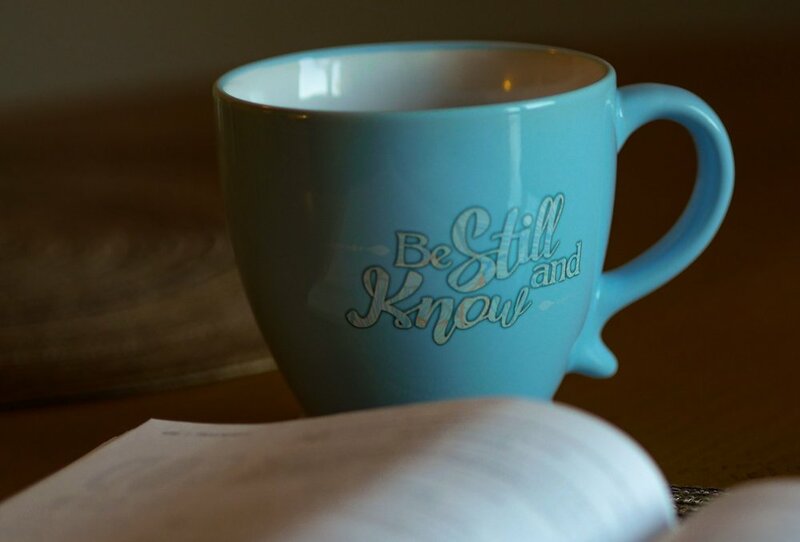 - Meditation – taking some time to meditate and be still, and give your brain a rest can really help build resilience in the modern world. We are constantly bombarded with messages and comments and images and content. We are continuously asked to engage and react. Having some self-control to sit still, focus inwards and allow the mind to settle and rest is crucial. - Understanding the difference between a real world and an online world Think and have discussions about the difference between how your real life is different to what we read and experience on the screens. 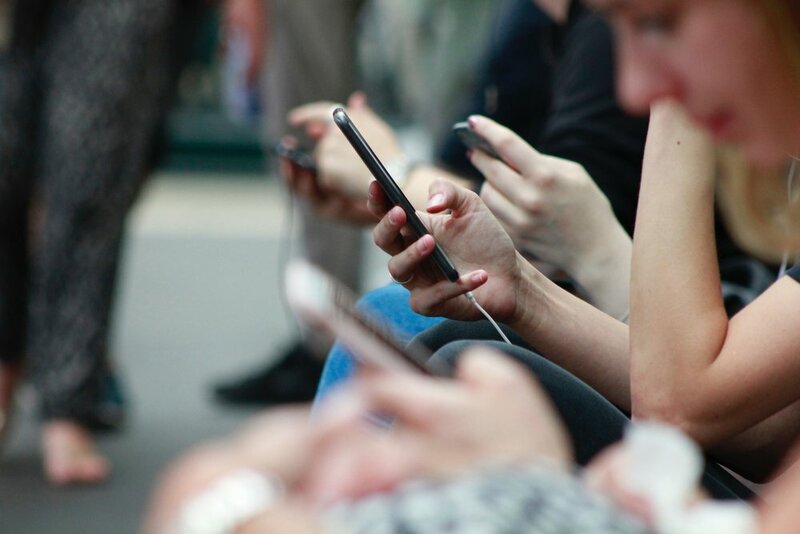 - Noticing how you feel and what emotions surface when online Leading a more mindful life can help you notice how you react to stressful situations or experiences. Talk about how you feel with a loved one, and notice any habitual behaviour. Why am I posting? Vanity/pride? What image am I showing? Real/filtered. Do we need to share everything? Most of the time, we use the internet or social media in a passive way. A passive use of reading and scrolling is more damaging to our health than actively posting and commenting. YOGADOO founder will be talking more about how yoga and meditation can help build children’s digital resilience in an online digital world, this weekend at the Achieve exhibition in Bristol. More details here. YOGADOO founder, Lucy Aston will be amongst the experts talking at the prestigious Achieve well-being exhibition in Bristol this weekend. The Speaker line up includes MasterChef’s Gregg Wallace, comedian Helen Lederer, Winter Olympic Legend Eddie “The Eagle” Edwards and Welsh rugby referee, Nigel Owens. Now in its second year, Achieve was founded and curated by TV Presenter Martin Roberts to help improve happiness, health and wealth, and takes place this weekend at the Passenger Shed in Bristol. Thousands of people are expected to attend the exhibition to watch cookery, visit stands, take part in fitness demonstrations and listen to celebrity and expert speakers. YOGADOO founder, Lucy Aston will be discussing how the ancient practice of yoga and meditation can help children become more resilient in a digital world and how YOGADOO has become the leading children's yoga and mindfulness training company in the area in just two years, working with thousands of children and young people every year. Lucy's talks are at 1:30pm on both the Saturday and Sunday, in Break out room 2. Tickets are available for the day/weekend via the link below. Ticket prices start at £25 for a one-day pass. YOGADOO will also be running a "chill out" area at the event, where adults and accompanied children can relax, unwind and reflect on what they have experienced at the exhibition. 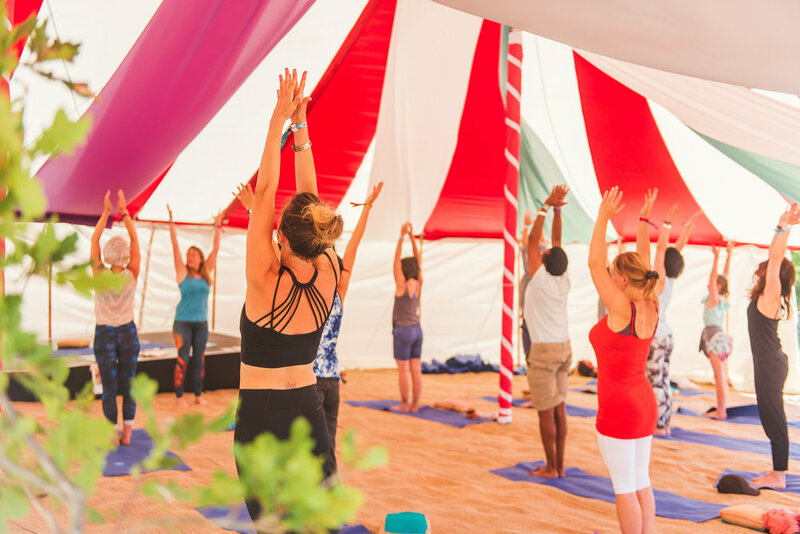 In the YOGADOO Zen Den, you will be able to enjoy free samples of Pukka tea, do some mindfulness colouring and journaling, recline on beanbags and cushions and listen to some calming music, there are also free yoga and meditation sessions throughout the day. YOGADOO teachers Lucy Aston and Robyn Blackmore will run hourly FREE drop in yoga and mindfulness meditation classes for children, adults and families. The YOGADOO Zen Den timetable is listed below. These sessions are suitable for beginners and YOGADOO will provide all the mats, you just turn up in something you can move easily. Simply sign up on the day or say you are ‘Going’ to our Facebook event, spaces are limited. When there is not a class running, you are welcome to relax and enjoy your own yoga and meditation practice on the yoga mats provided. 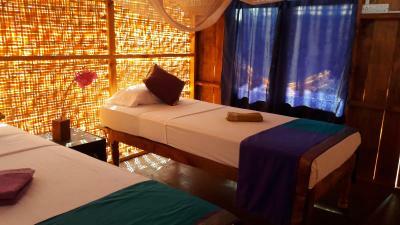 The YOGADOO Zen Den will be open from 9am-5:30pm each day as a place to escape the crowds, to relax and unwind. For tickets, please click here. Children under 16 go free, concessions discount available. YOGADOO founder Lucy Aston and fellow YOGADOO yoga teacher, Bex Bridgford will be leading yogis in four, free of charge open classes each day across the Om Show weekend. The sessions are themed around Pukka’s brand new range of Latte blends, four delicious, healthy, indulgent treats packed with organic, practitioner grade spices and adaptogenic herbs to support you throughout your day, with no added sugar in sight. The Om Show takes place at Alexandra Palace in London next month (19-21 October). YOGADOO founder, Lucy Aston will be appearing alongside celebrities and other leading well-being experts at a health and well-being event in Bristol next month. Lucy will be giving talks on how yoga and meditation can help children become more resilient in a fast paced, modern world at the Achieve event, at the Passenger Shed in Bristol on 13/14 October. The event is hosted by TV Presenter, and former “I’m a Celebrity” star, Martin Roberts. More than 50 wellbeing brands and experts will be on hand to give advice on wealth and health and happiness over the two day event. Other speakers at the event include Winter Olympian and all-round hero, Eddie “the Eagle” Edwards, Calum Best and Masterchef’s Gregg Wallace. Former BBC journalist and mother to ten year old Freddie, Lucy launched YOGADOO in 2016 to encourage and support children and young people to learn yoga and meditation from an early age, and help them build resilience and confidence in a fast-paced world. Based in Bath, YOGADOO now has six teachers working in over 50 schools across the area, and running children's and family yoga events nationwide teaching thousands of children each year. Lucy is a passionate campaigner for mental health issues, especially those concerning children and young people, and works on a number of projects with national charities and organisations. Lucy will be giving a talk on both Saturday and Sunday. More details to follow. YOGADOO will be running the brand new "Zen Den" area at Achieve, designed to be a peaceful and calm place for you to relax and unwind. YOGADOO teachers will be running free "Drop in" yoga and meditation sessions, for all abilities, throughout the weekend. Head to the "Zen Den" to reserve your spot on the mat! OUR HOLIDAY CLUBS ARE HALF FULL ALREADY! Theme: YOGADOO Non-spooky Halloween Holiday Club. Tues 30th/Weds 31st October. Book two YOGADOO holiday club dates and add HALLOWEEN to your promo code to receive 10% off. 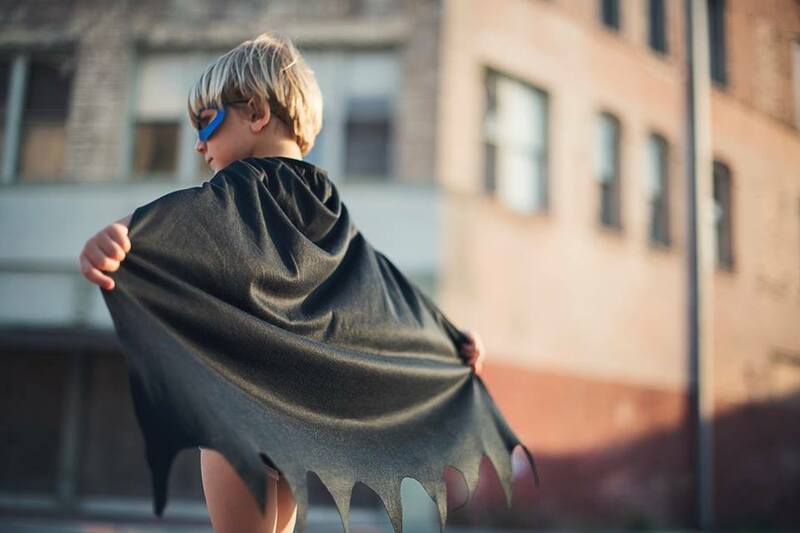 YOGADOO is running two Halloween half term Holiday Clubs with fun and non spooky activities for children! Children will enjoy a fun-filled day of (non-spooky) Halloween themed yoga, dance, games, stories, relaxation and arts and crafts at our YOGADOO Holiday Club Weds 31st October. From enjoying the changing colours of the Autumnal great outdoors, to learning to work together with acro yoga, to getting creative with Halloween arts and crafts and putting together a “yoga dance”. 9am-4pm. Limited spaces. YOGADOO Holiday Club, Weston Methodist Church, Kennington road entrance, Bath. Half days are 9am-12pm, 1pm-4pm. - Halloween Crafty fun and colouring! YOGADOO has announced a partnership with leading children and young people’s charity, Bath Rugby Foundation. Specialist young people’s yoga and meditation teachers from YOGADOO will pair with Education Officers from the charity to work together in schools throughout Bath and BANES to run the Stand Tall programme which helps pupils who can’t access normal classroom learning due to social and emotional challenges. 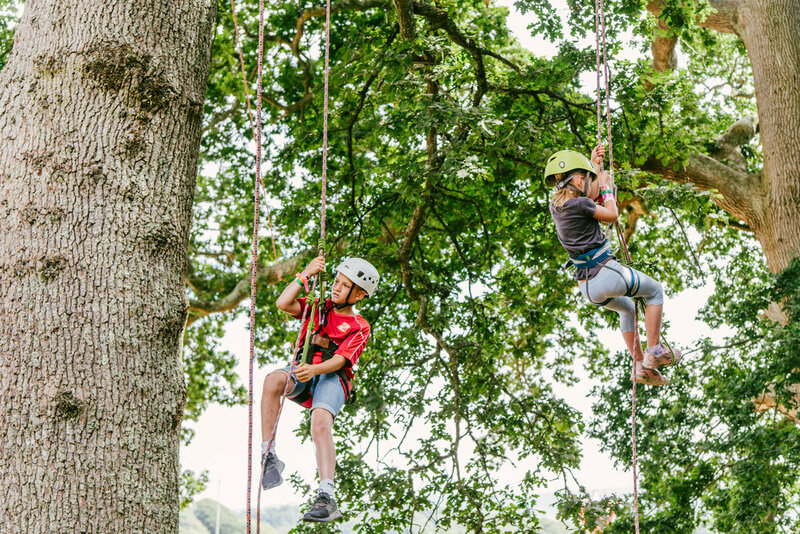 Bath Rugby Foundation is the charitable arm of Bath Rugby Club which was set up to empower young people to succeed, using a variety of different sports and activities to engage school pupils across the area. YOGADOO is an award-winning company based in Bath, providing specialist children’s yoga and mindfulness meditation teachers to more than 50 schools across Bath, Bristol, Somerset and Wiltshire. After the initial six-week pilot programme at two schools in Bath and BANES, YOGADOO and Bath Rugby Foundation plan to roll out the scheme across the county. For more information about the programme, please contact jonathan.wood@bathrugby.com or lucy@yogadoo.co.uk. This weekend we were at Camp Bestival and despite the wind and rain putting pay to Sunday's fun, the festival didn't fail to disappoint. It's our fourth time at Camp Bestival and every year the experience is different but glorious. 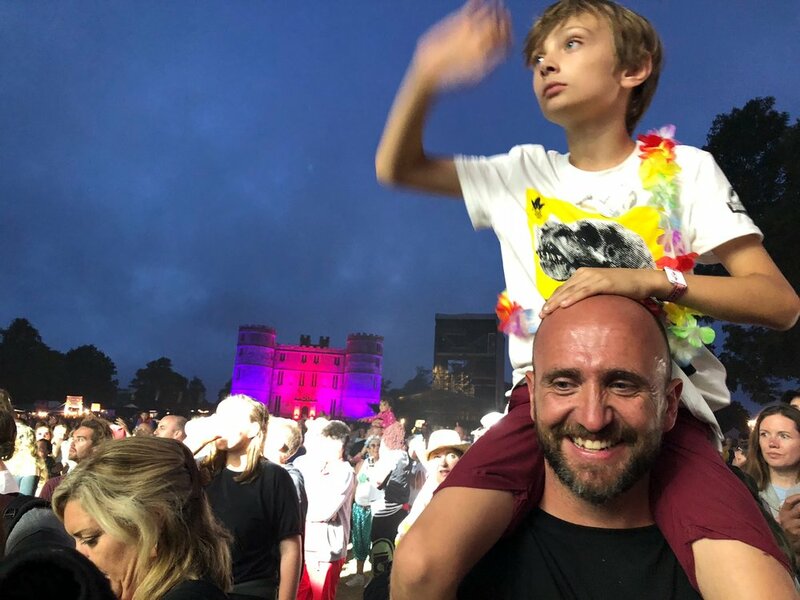 As our son gets older (he's ten now, but first went when he was four) he is looking for different things from a festival and each year Camp Bestival delivers. Unfortunately the organisers had to make the difficult decision to cancel the Sunday's lineup because of incredibly strong wind and rain storms. But until that point it was business as usual at this award-winning family festival. What's great about Camp Bestival is that everything is within a short walking distance of everywhere else. We took our camper van and were parked in Campervan A field, which was a 15 minute walk to the main arena and from there the kid's field and beautiful "Dingly Dell" wooded area was a 5/10 minute walk. Our son, Freddie is completely obsessed with nature and wildlife so loved the forest school and wooden craft activities, he also spent lots of time talking to the wildlife charities learning more about their work! The Dingly Dell rainbow bunting filled area was perfect for some shade and cool breeze in the hotter moments and with a good coffee kiosk, so the adults were kept happy too! Just a short walk up from the woods, I spent many a happy moment in the Slow Motion area where a lot of the yoga, meditation and therapy sessions were running. It's a lovely part of the site overlooking the green spaces which surround Camp Bestival and it really offers a little sanctuary from the more crowded areas. You can read and relax and just unwind. The musical lineup was good, and the Cuban Brothers kick-started our Friday afternoon, and Sara Cox's DJ set was perfect to get us into the party mood. Rae Morris was just gorgeous and Rick Astley persuading Baking Legend Mary Berry to go on stage to play the drums during his set was as bizarre as it was brilliant. Look here if you think I was dreaming! The Junior Jungle set on Saturday was just perfectly bonkers to dance the afternoon away as the rain storms threatened. And Clean Bandit put on a good show to round-up the main stage activities on Saturday night. We also really enjoyed heading over to HMS Camp Bestival to see the "Blue coats" entertain the children and Rob Da Bank (who founded the festival a decade ago) did a great DJ set on Saturday afternoon. The acrobats and circus skills workshop were also other highlights, and if you haven't seen the Wall of Death motorcycle show before, it's definitely worth a look (although you do pay extra). 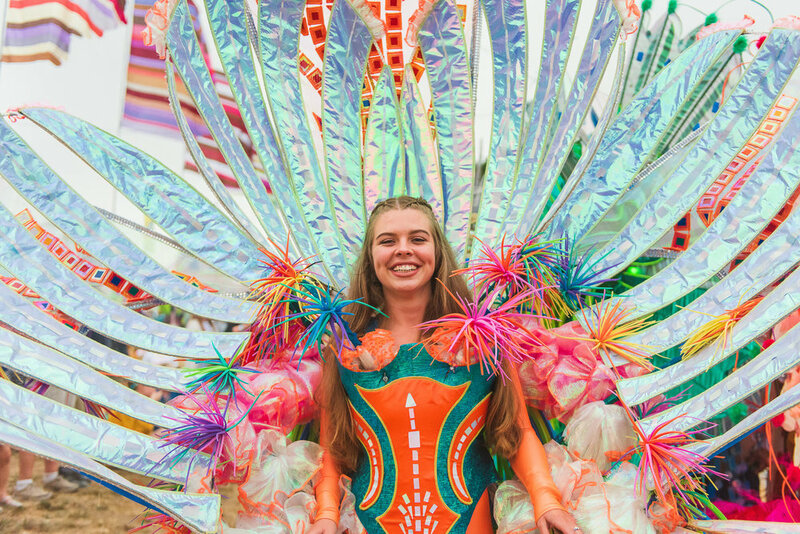 The backdrop of the coloured lit castle and the fairground is beautiful and a ride in the big wheel is a must to appreciate the festival with a bird's eye view. The range of food stalls is really fantastic and although not cheap, are pretty good value for the standard of food you get. 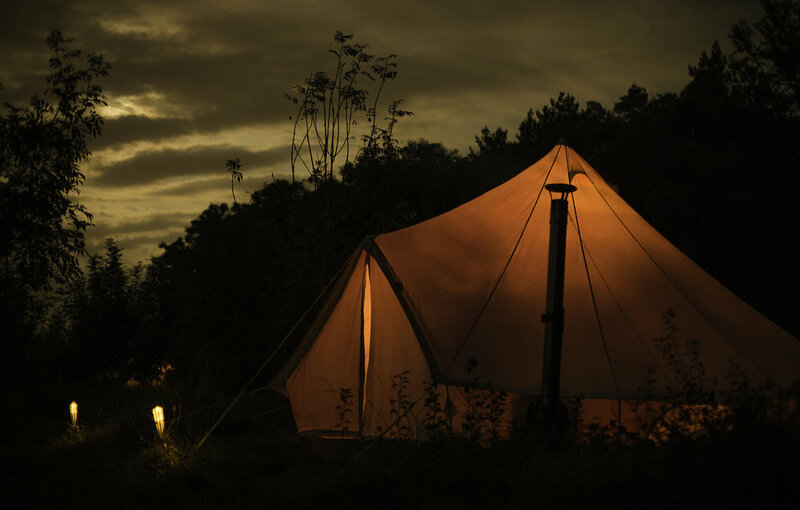 Our advice would be to try and go back to your tent/van for tea for at least a couple of nights if you are there for the 3 or 4 day duration, as a) it gets expensive and b) everyone needs a little breather around tea time, a chance to get into warm clothes or top up the glitter! What we love about Camp Bestival is the true family spirit we've seen amongst fellow campers, if a child gets lost, there is an army of parents on hand to form a search party, if you need anything at all (Calpol/coffee/a pump for an inflatable flamingo) you don't have to go far to ask someone who can help. This "True Brit Grit Resilient Parenting" was fully on show on Saturday night and Sunday as the weather began to turn. Just a little search on social media will show you a beautiful gallery of parents having "tent parties" and finding ingenious ways to entertain children as they waiting to hear whether Sunday's lineup would be cancelled. 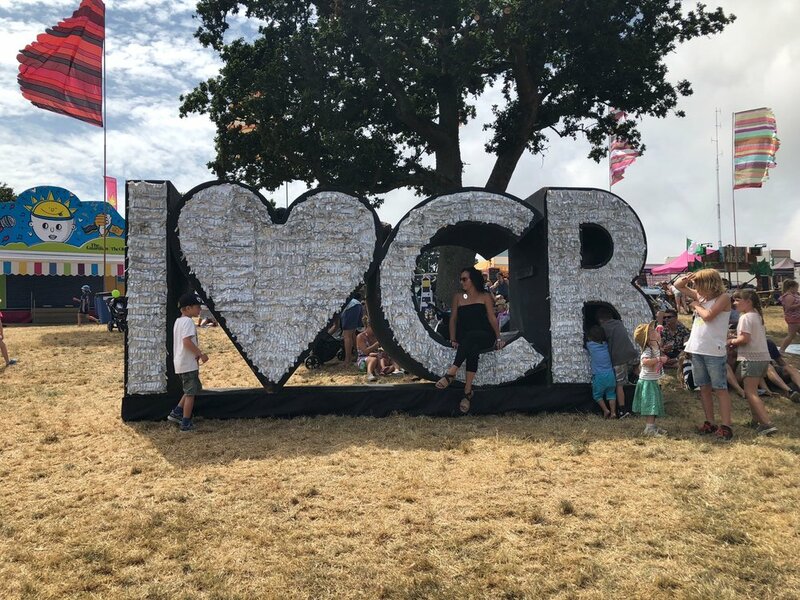 When the unfortunate announcement came, many stayed on site to make the most of their final festival day as the wind and rain battered the canvas of their tents. And that's what Camp Bestival is all about. The family spirit. 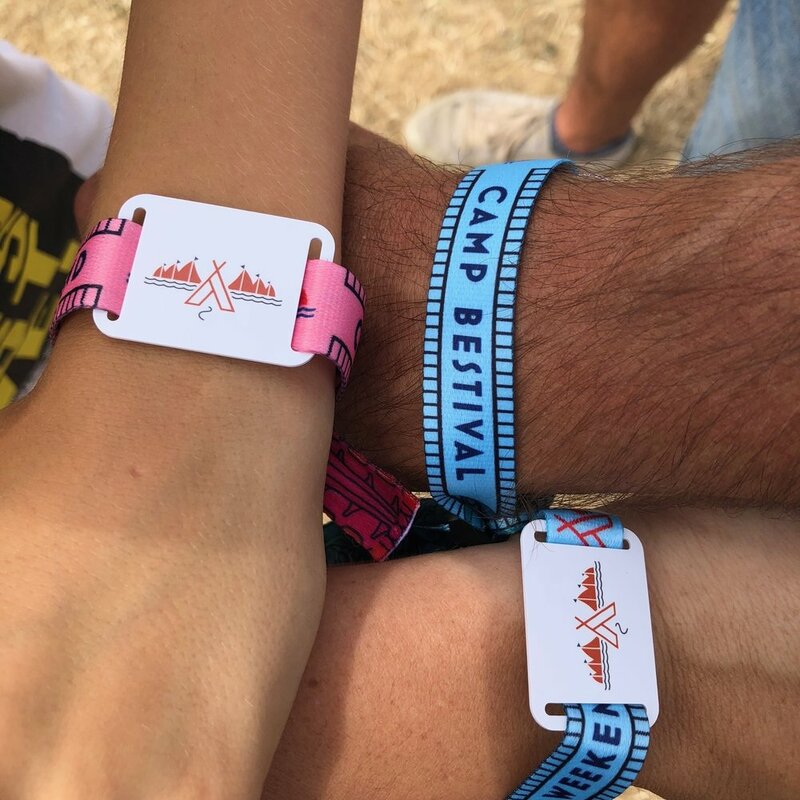 YOGADOO founder Lucy Aston and her son Freddie were gifted the Festival tickets by Camp Bestival. OK the summer holidays are officially here... and there are a couple of changes to the YOGADOO timetable. You can use your class pass across any class. The following classes are on (with cover teachers listed where appropriate) MOVE GB please just book as normal for the dates which are running. Back to normal for all classes Monday 3rd September. 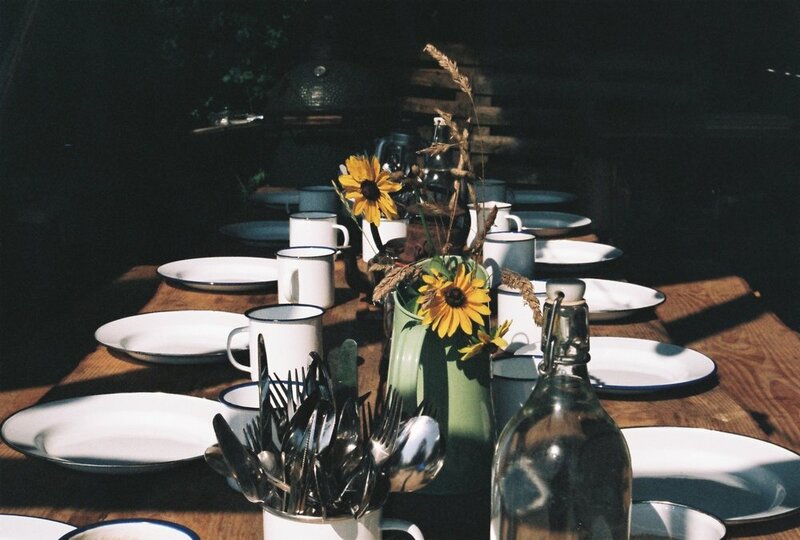 YOGADOO presents The taste of Indian Summer weekend yoga retreat at the beautifully unique, boutique camping site, just 5 miles from Bath. Retreat dates Friday 28th-Sunday 30th September. Inspired by their recent trip to India together, YOGADOO founder, Lucy Aston and her friend and fellow yoga teacher, Bex Bridgford are joining forces and their passions to bring a flavour of India to Somerset. A weekend celebration of India through yoga, meditation, connecting with the outdoors, sumptuous Indian cuisine, Bollywood dancing, Indian head massage workshops, an essential oils experience, sound bowl meditation, Indian-inspired crafting and much more! Disconnect to Reconnect we hope this retreat will give you the opportunity to relax, unwind and connect with nature and yourself. Strictly limited to 14 places. 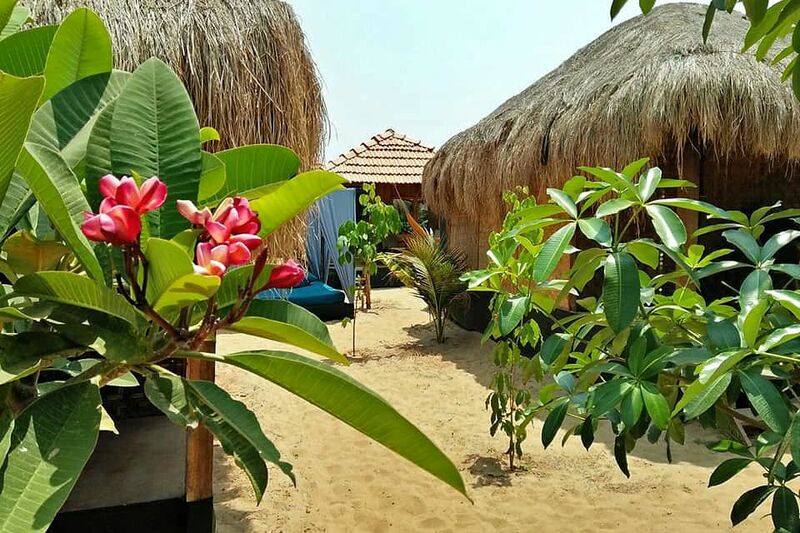 From 2:30pm Arrival and a welcoming offering of classic Indian chai and fresh juices, opportunity to enjoy a swim at The Farm Camp heated indoor pool. Begin to unwind and settle into your Indian inspired home for the weekend. We will also have henna artist to offer optional, complimentary small henna tattoos throughout the evening. 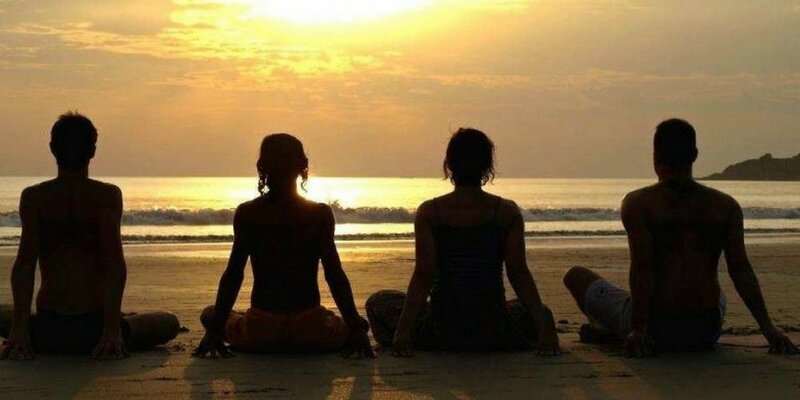 Yoga and Meditation workshops will be run by Lucy and Bex - classes will be fun, positive, and help you build a stronger connection to your body, blending the classic yoga poses into a beautiful mix of vinyasa flow that carries a creative feel with Indian-inspired soundtrack, whilst Forrest offers us a more dynamic class full of variations suitable for gravity surfers to beginners offering you a holistic approach into poses and can be modified to meet you where you are in your practice on the day. As a real treat and we are delighted to welcome our guest teacher, massage therapist Lizzie Longhurst to give us an introduction to Indian head massage. This is a traditional Indian Ayurvedic therapeutic massage and an uplifting, yet relaxing treatment which will focus on you and your partner’s head, neck and shoulders. Using traditional Indian massage techniques to stimulate your upper body Marma points to rebalance and release held tension. This massage is great for stress related conditions, headaches, skin and hair health, postural imbalances and will leave you feeling re-energised and relaxed. We will use organic cold pressed oil for your head, but you can experience without oil if you prefer and the treatment is fully clothed. It is a wonderful massage to give to family and friends. To complement our Meditation experience we will enjoy a crystal sound Bath to help you slip into a complete bliss. Scientific studies show that the vibrational sound creates a relaxed and meditative state, sleep can be improved, emotional shifts can happen. The meditative healing sound of the crystal sound bowl resonates and helps create harmony within the body, bringing you into a balance, this will be suitable for complete beginners. Our afternoon of craft and other activities will include and introduction to journaling, we will create our own Indian meditation mala beads, enjoy a mindful nature walk, Indian mandala creation and more. To delight your Indian senses further Lucy and Bex have designed a stunning sensual menu with flavours and smells that remind them of India. Inspired by the smells and tastes of the classic Ayurvedic diet that ordinates from India, but adding a modern twist to give you energy and the sense of being cleansed. The Earlybird price for the full weekend is £425 (payable in instalments*) or £455 after the Earlybird deadline of 30 June. There is a gallery of images below, please click on each picture to see the next image. - All meals, snacks, drinks, throughout the weekend, and wine on Saturday night. - NOT INCLUDED but bookable in advance 1-1 Treatments: Book a well-earned treatment with Lizzie to complete your yoga weekend and feel even more relaxed. 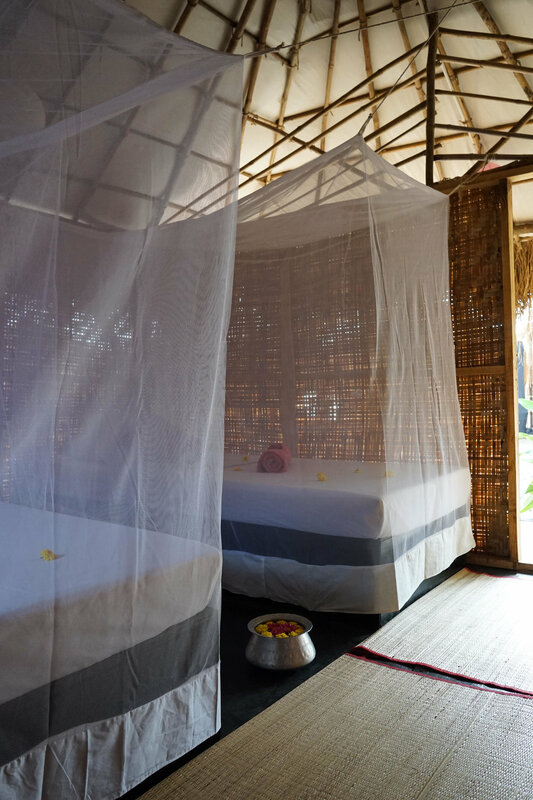 Choose from or ask for a blend of Holistic massage, reflexology or Thai Yoga massage (Thai only available for longer sessions). More information will be sent on booking. You cannot have escaped to notice that everyone seems to be talking about “mindfulness” and “meditation” recently? But what is your image of meditation? Have you tried it? What do you think it feels like to meditate? What makes this course different is that we immediately make the meditation training completely applicable to real and modern day situations. How to meditate in noisy or busy environments, how to move mindfully, and how to meditate or practice mindfulness when our mind is just too busy. Over the five week course, through practical exercises you will learn methods to manage stress, anxiety and moods. There are two courses running, one on a Monday evening at Weston Parish Hall (PLACES AVAILABLE), one on a Wednesday at Weston Methodist Church (SOLD OUT) - booking link at the bottom. 1) Why we practice mindfulness and meditation, what is the difference between the two practices and we’ll learn the foundations of mindfulness meditation. 2) The science bit, how does meditation and mindfulness work? 4) We’ll explore mindful movement, and meditation on the move! £50 for five week course. Have a great half term everyone, and look out for some new classes starting after half term, for adults and children!! YOGADOO founder, Lucy Aston went to listen to musician Professor Green at his appearance at the Forum, as part of the Bath Festival. The appreciation for the strong female role models who raised him, a potential career in politics, his love/hate relationship with social media and why mental health education should be on the school curriculum, were just some of the subjects Professor Green touched on last night, where he was speaking as part of the excellent Bath Festivals 70th anniversary programme. Musician and Documentary maker, Professor Green – real name Stephen Manderson has become one of the most high-profile, celebrity campaigners on mental health issues. Born in 1983 and raised on a Hackney Estate, Professor Green’s music career began with his album Alive Till I’m Dead in 2010 and saw him collaborate with Lily Allen and Example, amongst others. Having battled anxiety and depression from an early age, he has worked tirelessly to raise awareness of mental health issues, becoming a patron of the charity CALM and making a series of thought-provoking documentaries. Professor Green talked emotionally and fondly of his love, respect and gratitude for the incredibly strong women who raised him. His Nanny Pat and his Great Granny Edie, the latter with whom he credits with instilling his love of storytelling after he’d creep down in the early morning (before the cartoons had started on the TV) and cuddle under his Gran’s blue blanket and listen to her stories. Professor Green spoke openly and honestly about his Dad’s suicide and how it has taken him through a range of emotions through his life, and why hope and forgiveness is so important to recovery. What would you want your father to say to you if he was here in the room right now? “Sorry” – came the answer. One particularly emotional moment was where Green spoke about a dream he’d had in the last year or so, where he’d woken in floods of tears. “In the dream, I was flying a kite and the wind was really strong, I heard my dad’s voice really clearly say ‘What are you holding on for, it’s easier to let go’ it was amazing to hear him say those words.” Green is also a proud patron of CALM, The Campaign Against Living Miserably (CALM) which is leading a movement against male suicide, the single biggest killer of men under 45 in the UK. It’s Mental Health Awareness week, and with the work YOGADOO does in schools, what does he think about the state of the nation’s children’s mental health? "It's crucial that young people find a way to express themselves, that helps when they are bottling things up, rap and music were my releases." So the message is, VOTE GREEN (This was a joke from the brilliant presenter Max Porter), but I actually think many of us would. Professor Green's book, "Lucky" is available now. YOGADOO is delighted to have launched a partnership with Bath Spa University to create yoga and mindfulness films to help students to relax and cope with potential exam pressure. The videos – which are also available to current students and staff – are being sent to all applicants offering guidance on well-being and mindfulness, and have been created with local Bath company, YOGADOO and feature founder, Lucy Aston. Available on the University’s YouTube channel, each episode covers a different topic, including how to relax, concentrate, release tension and sleep better, with their release timed to coincide with national Mental Health Awareness Week (14-20 May). As well as advising on the videos, YOGADOO teachers are running a series of yoga and meditation sessions for the University’s Students’ Union, as part of its 'Stamp Out Stress Week during Mental Health Awareness week. 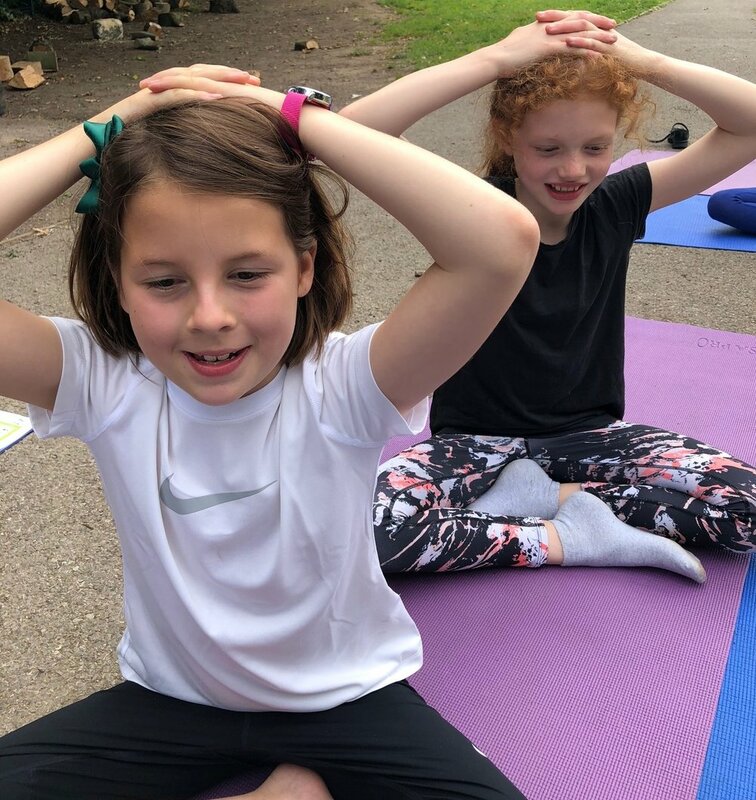 “Exam time can be such a stressful period for students, whatever level of study they are at,” said Lucy Aston, Founder of YOGADOO, who work with over 50 schools across Bath and Bristol, delivering yoga and mindfulness sessions to children of all ages. YOGADOO Founder Lucy Aston will be running "drop in" yoga and meditation sessions, and giving away free Pukka tea to students on the Newton Park campus (Behind the main house) on Wednesday morning. This week is Mental Health Awareness week, and the theme for this year’s campaign is STRESS. Goodness me, I’ve suffered from the effects of stress in my time. I would even say I reached burn-out point a few years ago with a combination of things going on in my life at that time. I know all too well that feeling of a dark cloud above you from the moment you wake up, the sensation of “walking through treacle” to try and get even the smallest tasks done and just the overwhelming emotion of failing, all the time. Yoga, and more specifically meditation saved me, it really did. Deciding to pack myself off to India to retrain as a yoga and meditation teacher two years ago, although I didn’t appreciate it at the time, was about to completely change my life. And completely change how I viewed my own mental health, self-care, and ultimately my relationship with stress. I was always a bit of a stress junkie you might say, I trained as a BBC journalist and I thrive on short deadlines. This transfers to all areas of my life, I very often self-impose tight deadlines on myself to give myself “the buzz” of getting things done. But this brings with it, stress. And what I’ve realised is it isn’t just stressful for me, it was having an impact on colleagues, friends and family who were waiting for information or work from me and in it would fly just on the right side of the deadline. “Yes, I’ve still got it”. I still have a bit of this in me, I think I always will. But I am aware of it now. I’ve also realised that there is enough stress in life, without me feeling the need to add more. The way I deal with stress now has also changed. I used to let it build up, ignoring it, the eternal tidal wave of burden constantly biting at my heels. I used to let it chase me, occasionally turning around and bashing it on the head with a virtual comedic frying pan, but it was always there like a terrier puppy, keen to get my attention. Eventually it would build to the point where the wave would swallow me whole, and I would drown in a sorry mess, only for my loved ones to pick me back up and start me on the same path once again. Now, I see stress as (a necessary) part of life, it’s not something to be ashamed of, I deal with it in the same way as I need to eat. I have learnt to prioritise, to cut unnecessary stresses from my life, write lists, reflect and not rush. I also meditate every day, even if it is only for five minutes – but I try to do twenty. This might sound like a complete luxury, but I absolutely promise you I much more efficient for the rest of the day when I do this. Of course, it takes time and energy and practice to meditate, but for me it’s the simple sensation of stillness when faced with chaos. Forcing the calm, controlling the breath, being in the moment when all your brain wants to do is run away with you. Nature gave us the ability to spot danger and respond to it. When faced with dangerous or stressful situations, our body and brain kicks into “fight or flight” mode. But we don’t like to stay in that state for long. We like to deal with danger quickly so we can feel safe again. But if we are shielded from danger or stress, we don't learn how to deal with it. I am going to talk more about meditation techniques later in the week, and I’ll also be announcing a brand new meditation course I’ll be running which will start later this month. Ironically, as well as this week being Mental Health Awareness week, thousands of children will also be taking their SATs. Over the past few months, YOGADOO teachers have been working with a number of primary schools in the Bath and Somerset area to work with year 6 pupils specifically to prepare them for these tests. I’ve also worked with some children one-to-one privately to teach and develop resilience skills in coping with stressful situations. I have said to all of these children, teachers and parents, that we are not looking at the SATs in isolation. Life will throw at us a series of potentially stressful events, situations and phases and the yoga and meditation we learn will equip them for life. Sometimes these are minor, temporary pressures where we feel a bit unsettled but can carry on with life as normal, sometimes these will develop into serious and traumatic times where we find it really difficult to function. What yoga and meditation teaches us is to notice how we are feeling in the present moment, to recognise our emotions, to listen to our bodies and to respond. We also teach that it is OK to ask for help. It is always OK. We all need to do this from time to time, and there is always someone to speak to. Talking helps and there’s always a way to sort out whatever the situation might be. I have heard a lot of talk amongst parents and in the media about how the SATs are “unnecessary stress” for the children. I agree that building the SATs to be something they are not is unnecessary, and they should be viewed with a sense of perspective and nothing more. But I actually believe some “planned” stress for children is good, and further than that, it’s essential. At least with “diarised” stressful encounters, we can prepare the child and teach them valuable coping mechanisms and skills. How else will we prepare them for life? And the pressures and stresses ahead? Prolonged periods of stress is of course, no good for anyone, but I really think that learning to deal with stress is a good thing, it helps children to gain confidence, experience problem solving and build resilience. So how do we help children cope with stress and prepare for stressful situations? Try to be an organised parent or carer, have everything you need and leave enough time to get to places, particularly on the morning of exams. Don’t create any unnecessary chaos. Children who sleep well are likely to be less irritable and better able to handle school stress. If they have things on their mind at bedtime, help them to write a list, and tell them we will work through the list together to resolve their worries. Keep talking to your child, but also know when to stop. Let them know you are on their team, you can help them resolve any worries by working together, but be aware of the “white noise” effect that constantly asking them if they are OK can also have. Sitting or lying still with our eyes closed, and focussing on taking slow deep breaths can really help to calm the mind and body. With the emphasis on stillness, trying not to fidget, maybe placing a hand or toy on the child’s belly so they can tap in deeper to the sensation of the breath coming and going. Counting the breath in and trying to match the length of the breath out. Leaving little positive notes of encouragement for your child to find is a really sweet way to help relieve stress. Popping a little affirmation in their pencil case, next to their bed or lunchbox can pepper their day with reminders that you are there with them, even when you’re not physically there. Do they really need to go to that after school club? Do that extra swimming session? When a child is experiencing extra stress, cutting out any unnecessary activities and replacing it with bonding time with you can really help to make them feel better. It sounds simple, but remembering to eat well and drink lots of water is essential. Cooking can be a therapeutic activity, so why not get your child involved in the design of the week’s meal plan over the exam period, not only are they learning about how important food is to help our brain function more effectively, they will no doubt include some of their favourite foods (which is always a nice treat) and it’s also a really great bonding time together. Stress is a part of life, as a parent if you can find age appropriate ways to talk about how you feel, how you sometimes feel stressed, about how sometimes things worry you, this will become part of a normal conversation you have with your child. You can also lead by example in how you manage your stress, let your child see you writing lists, enjoying ‘self care’ and relaxation time, practicing yoga and meditation, you may even want to try some of the activities together. Using digital devices, and (if the child is old enough) accessing social media can lead to a child feeling isolated and more anxious. Limiting the time on screens during stressful periods can be useful and replace it with activities you can enjoy together. Being away from screens can also be cause of anxiety and stress to helping your child to become more digitally resilient is really important too. If your child is experiencing prolonged periods of stress and anxiety, it is really important to speak to the school, and if necessary your GP. Never be afraid of asking for help, there is always a way to resolve the problem, and people are on your side. We're a FINALIST in the MUDDY STILETTO awards! THANK YOU so much! We are a FINALIST as BEST YOGA STUDIO in the Muddy Stiletto awards If you like what YOGADOO does, then Voting is live NOW here until 5.30 pm on Friday 18 May. Anyone can vote in the Awards (you don't have to live here). And Voting starts from zero - nominations from the first round are not carried forward, as it is now a 5-way competition between 5 Finalists, so even if you voted for us before, please can you vote again (so sorry to ask! ).